G.D.Shaw's Minisonic 2 synthesizer appeared as a construction article in "Sound Design" in the 70's. It was based on his Practical Electronics "Minisonic" which appeared in PE Magazine in 1974. The Minisonic in turn was based on the "PE Sound Synthesizer" that first appeared in PE Magazine in February 1973. 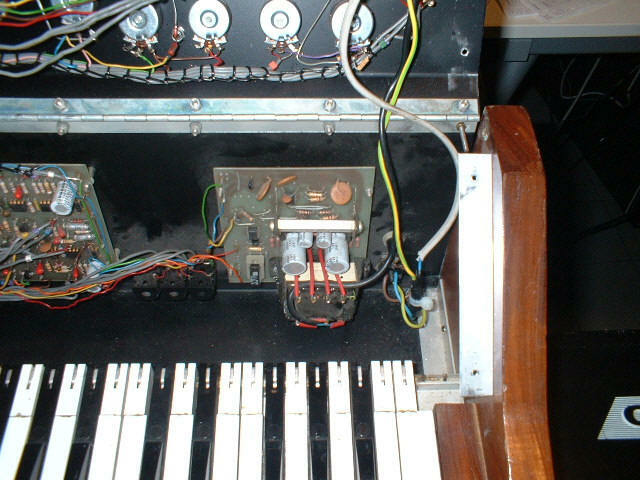 At the bottom of this web page you can also see some photos of Steve Thomas's original Minisonic2. Nov 2009: images of Minisonic Serial Number 1 have been added at the end. As a boy, I always wanted to build one of these synths, but could never afford the components. Well, now I can, so I recently decided to attempt the construction of the Minisonic2. I am very fortunate to be in touch with Doug Shaw himself, who has kindly sent me an original Minisonic2 printed circuit board, an original copy of "Sound Design" and several hard-to-find semiconductors (more on those below). Doug Shaw has an interesting web site now up. This document will be used to detail progress in the project. It may even be useful for some intrepid individual who decides to build one of these lovely instruments in the future! 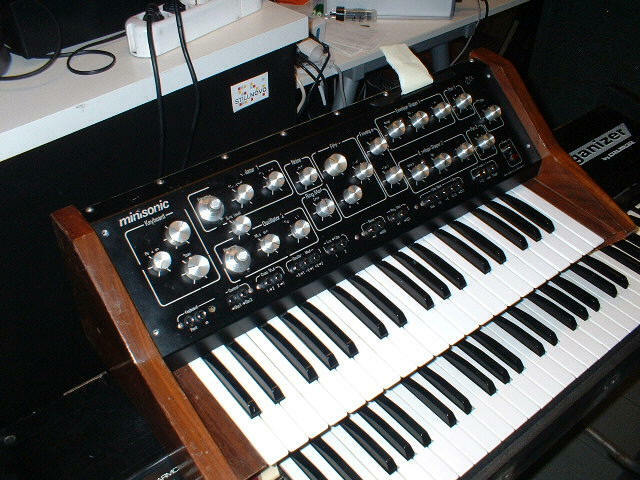 The Cloned Analogue Gear website has a lot of scanned articles and photos related to analogue synthesizers of yesteryear, including the Minisonic2 and the PE Sound Synthesizer. 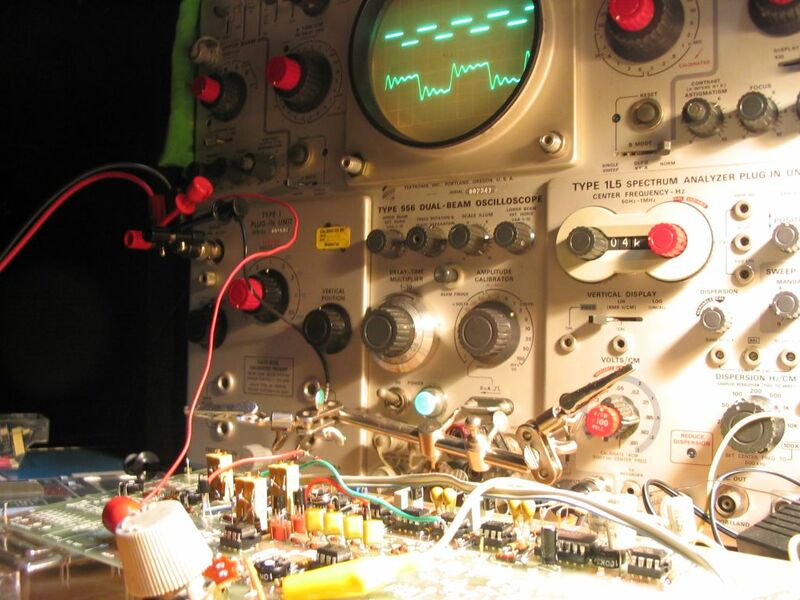 There is an excellent email list for people building synthesizers, run by Rick Jansen called Synth-Diy. This email list is archived, and the archive can be searched using this page. The design for the Minisonic2 is detailed in the PE book called "Sound Design", a copy of which Doug sent me. The following link will take you to a PDF file of the complete article, scanned. This is a 12MB download, so beware! Sound Design - Minisonic2. 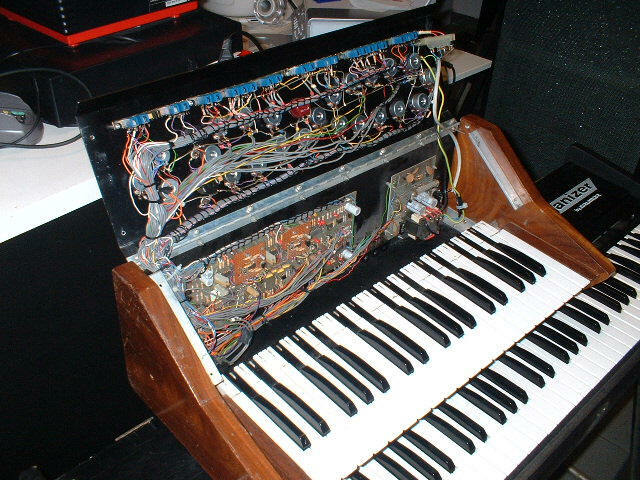 Yves Usson has an excellent site with a lot of material related to synthesizers of yesteryear. You can buy synthesizer keyboards at http://www.doepfer.de/preise.htm#Keyboards . Here are some images of the completed instrument. The following sections detail its construction. Fortunately the rest of the components are easy to obtain, and I ordered most from www.mouser.com (I already had a few in my component drawers). The way the keyboard works is as follows: underneath each key is a small flexible metal tongue that gets pushed down when the key is pressed. All the metal tongues are connected together by a strip of metal. When the tongue gets pushed down, it touches against a junction in the resistor chain. Thus a connection is made between the metal strip, the tongue, the junction in the resistor chain, and then all the resistors that are in the chain between the junction and the end of the chain. So an ohmmeter connected between the metal strip and the end of the resistor chain sees a resistance that varies linearly with the position of the pressed key. (Notice how only two resistors are within 0.5Ω of the nominal value, the rest are all greater in value!) Once sorted, I simply positioned them in the chain, soldered them in position, and then snipped away the resistors that came with the keyboard. Now the prototype keyboard was ready for use in testing the Minisonic2 as each of its electronic sections was completed. The two voltage controlled oscillators are controlled by a pair of transistor "ovens". The ovens are included in circuits called "VCO comparators" in the design. The ovens produce a current source that is temperature stabilised and whose value doubles for every 0.5 Volt increase on the comparator input. A precision ten-turn potentiometer is used to precisely adjust the input voltage, and thence the current being sent from the oven to the VCO (and thus the frequency of the VCO). The first obstacle I met was having to find a replacement for the MD8001 dual transistor IC, of which I only had one. Use of the MD8001 guarantees close thermal coupling between the transistors, and the device has particular linearity characteristics that make it desirable over e.g. the CA3046. A sub-optimal alternative is to glue together a pair of suitable transistors, and bind them with wire to try to get good conductivity between them. Initially, however, I tried a supposed "equivalent" to the MD8001, the MD708B, but this proved to be useless. I then glued and wire-bound together a pair of BC338s and used those. The setting up of the ovens is a bit of a fiddle, but I was able get very good current scaling with minimal adjustment of the presets, on both the comparators. Once the comparators were completed, I assembled the two VCOs, and attached the ccg (current source) from each comparator to each VCO. I then hooked up the 'scope and saw very nice sawtooths from each VCO, whose frequency I could vary with the 10 turn pots. if I use the scope and set both VCOs independently to a frequency of 1kHz precisely, and look at the vernier setting, both read exactly the same i.e. 4.8 (out of 10). So it looks like the low/mid/high are matched. However, the voltage measurements are a little different between the two. Recall that my VCO1 uses the MD8001 dual transistor, and VCO2 uses a glued pair of BC184. With VR10 wiper at -6V, VCO2 current with R58 disconnected cannot be reduced by VR8 below about 50uA. VCO1 can be adjusted to 24uA. Moistened finger on pair with R58 connected: I cannot stabilise VCO1 at any setting of VR11, the drift in the current is always upwards, but leisurely. On VCO2, there is negligible drift, and I didn't have to adjust VR11 at all (it remains at zero Ohms). This puzzled me, because I was expecting the glued BC184s to be more picky and difficult to set up than the MD8001. The Ring Modulator is based on the SG3402 IC. It was completed without any problems. The VCF uses a constant current source to drive a diode/capacitor ladder network, whose tuned frequency varies according the current. These caused me a lot of trouble, for some reason. For a start, TR4/5 obstinately refused to turn on and off as a function of the applied signal at the inputs. I was particularly bugged by the BC184 which was "off" with no triggering signal. Its emitter was slightly +ve, but only slightly. I could make TR4 turn "on" (i.e. make its emitter rise to +9V) by applying a +9V wire to its base. Normally the base is at +0.53V, with no applied signal, and this was insufficient to turn TR4 on. This voltage is set by R91 and R90, and should be 9V*3.9k/(75k+3.9k) = 0.44V (not sure why it is higher than that, maybe emitter leakage current?). I made the observation that both the Envelope Shapers have the same voltage distributions as in the table above (to within a few tenths of a Volt), so this argues against a wiring problem. Something more fundamental is wrong. I tried various other npn transistors in place of TR4, noting that some were better than others, until in the end I found some BF255 high frequency amplifier types, which seemed to do the right thing. The next problem was that the attack/decay rates were far too long ... several seconds when the attack/decay pots were at minimum value. In the end I decided to simulate the first couple of stages using Linear Technologies LTSpice program, a free download. 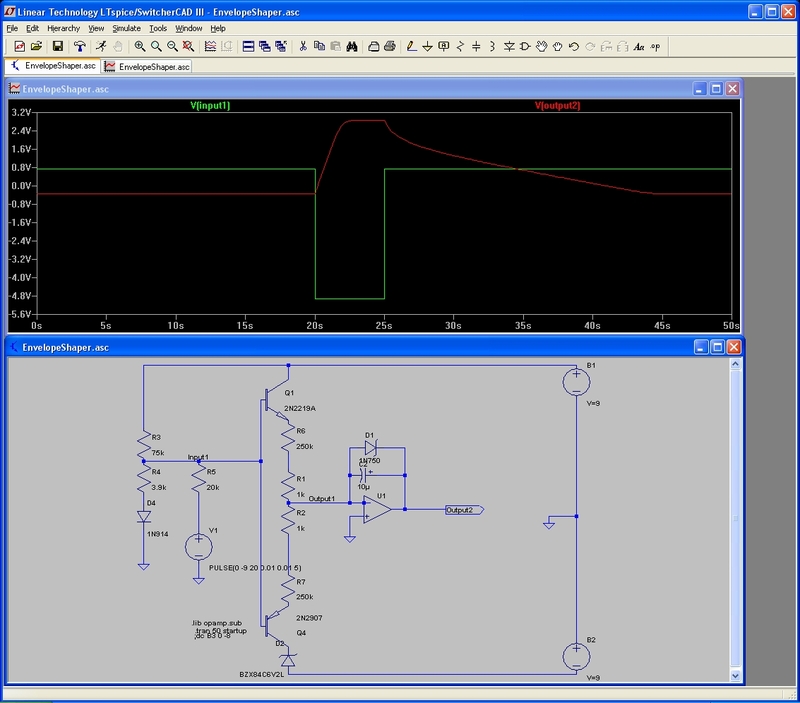 Here is the simulation, which produced exactly the expected behaviour of the output of the opamp, and NOT the behaviour I was seeing. The interesting aspect is the voltage source V1 � this is set up to produce a -9V pulse after twenty seconds, hold it for 5 seconds, and then revert to ground. This is as if the user presses a key on the keyboard for 5 seconds. The upper diagram shows in green the voltage at the base of (Minisonic) TR4/5 � about 0.6V dropping to -3.2V when V1 pulse appears, and in red the output of the opamp. Note the rise and fall time of the envelope is lengthy: the same circuit with R6/R7 each a nominal 1Ohm shows an almost instntaneous rise and fall time. 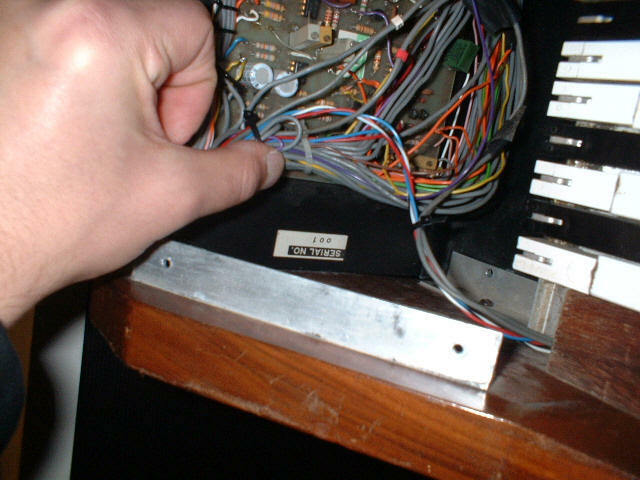 Update (May 2004): the reason for my problems with the Envelope Shaper front end is found: I had inserted the BC214 transistors assuming that their pinouts were the same as the BC184. They are not! Once I re-orientated the BC214s, everything worked fine. I was tinkering with the Hold circuit and can adjust VR7 so that there is very little drift indeed. I notice that, with the best setting, the voltage goes +ve very slowly, then goes -ve very slowly, turns around and goes back ... and so on. The period of this oscillation is about 30seconds. It seems that every time I turn the instrument back on after it's cooled down, then I have to wait for the hold circuit to settle. In Fig1 I am puzzled about the use of VR6 ... I set the wiper to midway and do not seem to need to alter it. Also in IC1 and IC2 ... I'm not quite sure how to do this. So I set it up as follows: with identical voltages on pin2 for both ICs, I adjusted IC1's output using VR4 to be the same as IC2's output. I have a problem with the Tune control, VR5. It doesn't seem to affect any of the voltages at IC1&2 pin 2. Yet point CC is certainly swinging between 0V and +5V. I must have something disconnected, since when written down this doesn't seem possible. A subtlety here is that the PCB doesn't contain places for IC10 and related components: they are to be mounted on the PSU PCB, which I do not have. Thus I needed to do something special. Moreover, I was advised by Doug that the HF triggering system was sub-optimal and that an alternative should be sought based on FET opamps. I have two TL071 FET opamps I'm experimenting with using for the hold isolator. Initial tests are encouraging, using a follower configuration. In fact I notice that Fig2 in the Sound Design article already describes a suitable very high input impedance follower circuit that I can maybe use for the Hold Isolator (see below). You will notice that I am still missing a couple of pots (in ES2 and Pan2). The foam core is sufficiently rigid that it easily holds the weight of all these components. the reduced size of all the switches on the board (now the miniature DPDT). Once this task is done, then it should be a simple matter(!) to remove the pots and switches from the mock-up panel, and re-insert them into the final plastic panel. Doug Shaw sent the following images from measurements made on a Minisonic2 with a waveform shaper tacked on to one of the VCOs. Click on each image for the full size version. Doug's notes are below each image. Range 'C'. Sweep 1Khz - 100Khz. Input signal 150mV p-p triangle. Resonant frequency 37Khz. Intermediate 'Q'. Output 100mV/div. Range 'A'. Sweep 0.5Hz - 300Hz. Input signal 150mV p-p triangle. Centre frequency 27.5Hz. Low 'Q'. Output 100mV/div. Range 'C'. Sweep 1Khz - 100Khz. Input signal 150mV p-p triangle. Mid-range resonant frequency. High 'Q'. Note interference pattern and peaks caused by changing harmonic relationships at different points of resonance. The sound is marvellous. Output 100mV/div. Range 'B'. Sweep 10Hz - 1Khz. Input signal 50 mV p-p sine. Centre frequency 100Hz. Low 'Q'. Roll-off 3dB - 1st Octave; 6dB - 2nd & subsequent. Output 50mV/div. 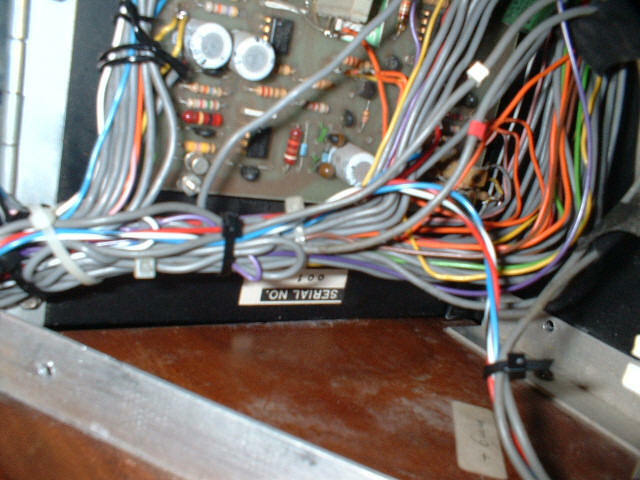 These photos are courtesy of Federico at http://stillnovo.com/ which sells, repairs and renews old synthesizers, amps and guitars.